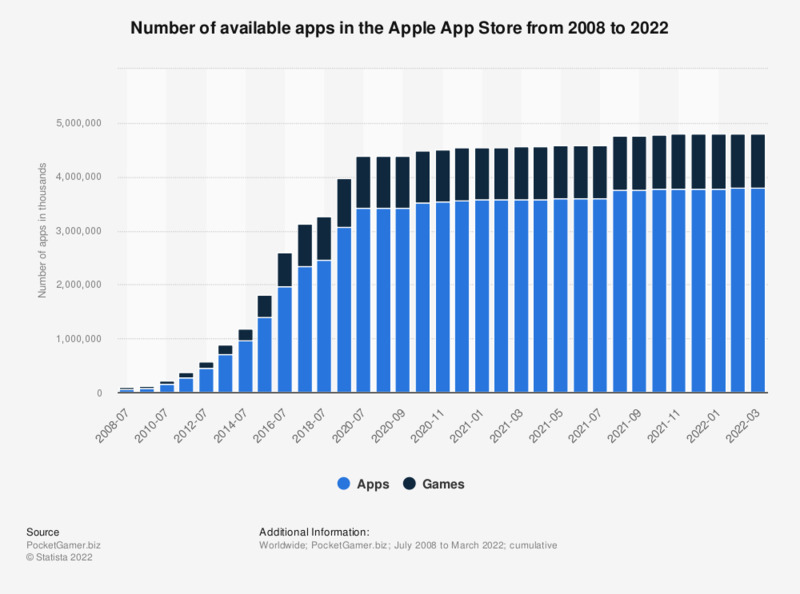 This time series shows the number of available apps in the Apple App Store from 2008 to 2018. In 2018, the App Store offered 811,911 gaming apps. In contrast, as of that period of time the store had 2.45 million non-gaming apps available. As of June 2017, 180 billion apps had been downloaded from Apple App Store. The Apple App Store opened on July 10, 2008 via an update to iTunes. This coincided with Apple’s launch of the second-generation iPhone 3G which supported mobile apps. Apps from the store can be downloaded directly to an iOS device such as an iPhone or iPad, or onto a personal computer via iTunes. Applications in the App Store are usually aimed at iOS devices and may make use of the specific attributes of those devices, such as motion sensors for game controls and cameras for online video calling. Mobile applications downloaded via the desktop version of iTunes are usually synchronized to iOS devices upon connection. As of March 2017, the most popular Apple App Store category was gaming with over 25 percent of apps being games. The second most popular app category was business, followed by education and lifestyle apps. Mobile gaming apps usually generate the majority of their revenue through advertising and in-app purchases with only little more than a third of games being paid downloads. Popular gaming apps in the App Store include Clash Royale, Candy Crush Saga, casino games and Clash of Clans, the currently top grossing iOS game.